Naomi Tetherly, a teacher for East Longmeadow Public Schools, specializes in helping students in early education, specifically pre-school and kindergarten. Previously she worked as the special education director and academic enhancement coordinator for Robert M. Hughes Academy Charter Public School in Springfield, Massachusetts. In her leisure time, Naomi Tetherly is an avid runner who enjoys a range of challenges from cross-country to trail running, the latter of which infuses new scenery and energy into an otherwise average running experience. Trail running involves running on rough terrain, which offers a unique set of challenges compared to running on pavement. Safety should be the first priority, such as knowing when to slow down to avoid injury, mapping out the area to avoid getting lost, taking some sustenance for a long run, and wearing the right shoes. Running in pairs is also recommended. Running on rugged terrain utilizes muscles that aren't usually used when running on roads. When starting out, short runs are the most beneficial, as the body grows accustomed to this new workout. Keep your eyes on the ground, scanning the area immediately ahead for any obstacles. Wear plenty of sunscreen during the day, and invest in a headlamp if running at nighttime. A successful cross country and half-marathon runner, Naomi Tetherly works professionally in the field of education, where she currently is pursuing a vice principal position in Western Massachusetts. Also an avid home chef, Naomi Tetherly enjoys entertaining friends with vegetarian and fruitarian dishes and Manhattan-inspired recipes for dinner and drinks. Perhaps the most iconic cocktail inspired by the famed New York borough, the Manhattan is thought to have originated in the late 1800s at the Manhattan Club in New York City. This fairly straightforward concoction, which is typically served before dinner, has been referred to as “one of six basic drinks” by David A. Embury in his book, The Fine Art of Mixing Drinks. To make your own Manhattan, mix two dashes of angostura bitters with one ounce sweet vermouth and two and a half ounces bourbon. Although the drink can be served over ice, for a traditional bent, stir the mixture over ice before straining it into a chilled glass. 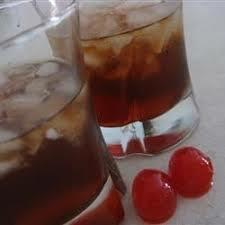 Complete your Manhattan with a single maraschino cherry, and enjoy.